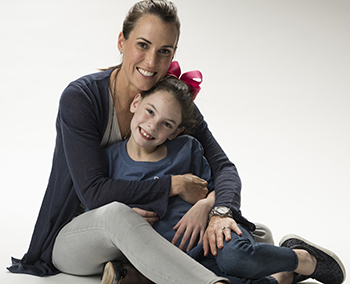 Emma Tramuto was 17 weeks pregnant with her daughter, Ella, when she and her husband, James, learned about Ella’s diagnosis of gastroschisis -- a condition in which the abdominal wall does not fully form and the intestines grow outside of an infant’s body. Ella was born at 36 weeks and at just two days old, she underwent her first surgery to rescind a large portion of her intestines. The very next day, she had her second surgery. “These two surgeries were both necessary to save Ella’s life; with the second, she was left with the bare minimum of intestines needed to live,” James said. She spent three months in the neonatal intensive care unit (NICU). “The rehabilitation from those surgeries occurred in the NICU, where Ella was taken care of by a team of doctors and nurses who became her second family,” recalls James. 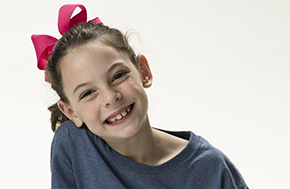 Ella was in and out of the hospital during the first few years of her life for various treatments and procedures. At two years old, she made significant progress and was able to stop using a feeding tube. Today, Ella is seven years old, and although she still has to undergo rehabilitation for short-bowel syndrome, a result of gastroschisis, her parents say she always keeps a positive attitude about her health. She has been able to make a difference in the lives of others by providing perspective on how to maintain a positive attitude, and she also serves as an example for other families whose babies face the same challenges she did.